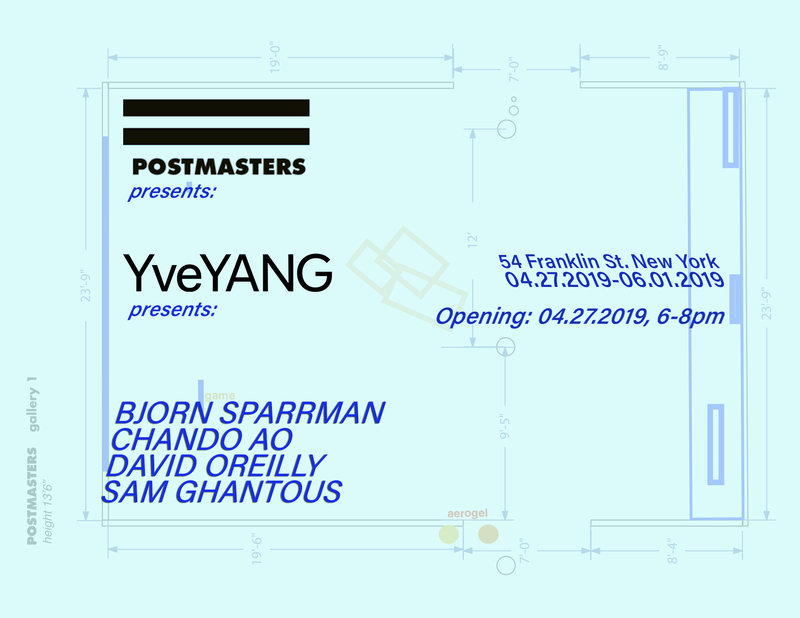 YveYANG is honored and pleased to be invited by Postmasters to hold a group exhibition of four artists in its front gallery. We create art with tech, promiscuous tech-spawning art. Technology that is accessible, learnable, observable, trackable, appreciable, and critiquable with which we fight and play. Chando Ao’s (b. 1990, China, now in US) practice focuses on making machinery works that distributes sensory experience to its confronters. In experiencing this unique sensation that the artist has created and directed, the audience simultaneously obtains a new connection to the existing world. Like learning a new language, it stimulates one's neural network and grows new synapses onto it. Ao received his BFA from Tufts University, School of the Museum of Fine Arts in 2016. He is the recipient of The Chan Sculpture Award in 2015. Sam Ghantous (b. 1989, Canada, now in US) operates at the edges between architecture and new media. His recent work contends with image culture and technologies, working between images, software, and spaces. He received a Master of Architecture from MIT where he now is an instructor. Sam has been published in Thresholds and PLAT, and has exhibited in New York, Shanghai, Cambridge, and Toronto. David OReilly (b.1985, Ireland) is a filmmaker and artist based in Los Angeles. As creator of the influential short films Please Say Something and The External World, OReilly also developed game Mountain (2014) and Everything (2017) which have been widely downloaded and played. Game Everything in the exhibition is a simulation of the universe where you can travel around as one thing at a time or as a group at a time. Also in the exhibition, Eye of the Dream is an audiovisual work that generates from the game Everything and presents the process of life from the Bing Bang to the modern world through the act of “dancing”. OReilly has lectured at Pixar, Harvard, Yale, USC, CalArts and at many other conferences and festivals around the world. He has written for Adventure Time & South Park, and created fictional video games in Spike Jonze’s Academy Award winning film 'Her'. Bjørn Sparrman (b. 1989, US) lives and works in Cambridge, Massachusetts. He received his BFA from Calvin College in 2012 and his Masters of Science in Art, Culture and Technology from MIT in 2016. Sparrman looks to find the link between materials and beliefs, and he finds that the ways in which we internally organize our beliefs inevitably interface with objects and materials. Sparrman is currently Project Lead at the MIT Self-Assembly Lab, a cross-disciplinary research design group. With the lab and in collaboration with many artists, designers, and companies, including Google, Steel- case, and BMW, Sparrman frequently exhibits work internationally. He has shown at the V&A London, the Cooper Hewitt Smithsonian Design Museum, the Milan Furniture Fair, Design Miami, and Ars Electronica in addition to others.